The Rolex Cosmograph Daytona, developed by Rolex, is an exceptional timepiece. This page will give you information about the Rolex Cosmograph Daytona and help with the function of your luxury watch. With the rise of the automobile racing scene in the early 1920’s, the demand for the combination of a wristwatch and a sport timer rose as well. This demand resulted in the creation of the chronograph. A chronograph is a wristwatch, fitted with the capability to time events while simultaneously keeping the time of day. Around this time, Rolex was improving upon the Oyster and Perpetual and had little focus set on a chronograph until the late 1930’s. The Rolex Oyster had become the watch that sportsmen desired but the desire for the Oyster would fall short of the demand for the chronograph, and thus, Rolex began production and released five new chronographs in the 1937 catalog. These new Rolex Chronographs were simple. They had only one button that would start, stop, and reset the timer function. The movement, unlike other Rolex models, was made by another company, Valjoux. Valjoux movements were economical, yet reliable movements used by Rolex as well as other competitors. Rolex first used the '23', the '72', and later the '727' caliber movements. These Valjoux chronograph watch movements were hand wound. The chronograph became quite popular, being used for any hobby involving time measurement. Consumers wanted more improvements on the simple, one-button system. They wanted to have the ability to stop the timer and continue it at a later time. In other words, they wanted to accurately time longer events that may include breaks without subtracting the break times from the overall elapsed time. This demand was met with the two-button configuration in the late 1930’s. In the midst of World War II, Rolex released their first true Oyster Chronograph model numbered 4500. This model had the 30”’ Valjoux movement, and due to the war, showed little success in sales. Shortly after the release of the 4500 chronograph, Rolex released the 6232 and 3668. These two models had the same Valjoux movement and a 30-minute register, but like the 4500, showed little success in sales. Reference 5034, in 1949, finally became the first Rolex chronograph featuring the ‘Oyster’ case in combination with 3 pusher buttons to operate the start, stop and reset functions. These were made in only 12 yellow gold and 12 pink gold versions. Over a period of time, Reference 5034 evolved into Rolex model 6034, which became Reference 6234, before it turned into Rolex model 6238, called the ‘Pre-Daytona’ chronograph with “Valjoux 72’ movement. Finally in 1960, Rolex decided on a major facelift for its chronograph line and the ‘Cosmograph’ wrist watch emerged as a Rolex model 6239, derived from the ‘Antimagnetic’ line. Rolex’s chronograph ceased to gain much popularity until 1961 when the 6239 in was released under the name “Cosmograph”. It had a more modern appearance due to the inner-bezel being engraved with tachymetric graduations. This aesthetic change sparked interest and increased sales, but the chronograph was still lacking in comparison to other Rolex models. Rolex released a similar model to Ref. 6239, the 6241 and soon, both wristwatches became known as ‘Daytona’ watches, ever growing in popularity since. Initially, Rolex offered a choice of dial configurations and one particular one, the ‘exotic dial’, is known today as the ‘Paul Newman’, a term never used officially by Rolex. Such dials featured either cream (with black registers) or black (with white registers) colors and within each totalisator square markers. Previous models were not truly waterproof. When people would push the buttons under water it would allow water into the movement. To fix this, Rolex made their final major modification to their manual wind chronograph in the late 1970’s, releasing the Rolex 6263 Cosmograph. It had screw down push buttons to fix the waterproofing issue. The 6263 was originally listed as being waterproof up to 165 feet, but was later listed as waterproof up to 100 meters or 330 feet. The chronograph still sat behind the other sport watches made by Rolex until 1986. 1986 marked the start of an unusually high demand for the Rolex Daytona Chronograph. This high demand was a result of the international market being explored by small time dealers. Chronographs were being sold at a discount in the U.S. due to the lack of popularity and thus a watch bought in the U.S. at a discount would be sold in Italy for the list price. The most popular being the Paul Newman Daytona. It had square sub-dial markings and an outer track that matched the sub-dial colors. The market price of the Daytona got up to around $35,000 U.S. in Italy right before Rolex discontinued production of the Daytona. With Rolex’s promise to release a new Daytona with a new look, collectors began buying all of the older model Daytonas. In 1991 Rolex released the new Daytona model number 16520. It had large sub-dials and an outer track in an opposing color. Rolex also switched the Valjoux movement in for a Zenith movement. It wasn’t until the year 2000 that Rolex made an in-house movement for the 116520 Daytona. This 4130 movement marked the first fully Rolex produced chronograph. This also meant that every Rolex watch now had an in-house movement. The Rolex Oyster Perpetual Cosmograph Daytona is available in yellow gold, white gold, stainless steel & yellow gold, stainless steel, and rose gold on either a Rolex Oyster bracelet or a strap. The newest model, 116515 features the Rolex Cerachrom Bezel, also known as the ceramic bezel, and sports the Rolex Chocolate Dial, all in a beautiful rose gold, 40mm case. The Rolex Daytona is still considered to be one of the most sought after time pieces in the world. Rolex, “Chronograph, Anti-Magnetique”, Ref. 3055. Made in the 1950s. The Rolex reference 3055 was first released in the 1930s with olive button chronograph and it was re-launched in the 1950s with the same reference number and with the same square button chronograph. In period advertising for this reference Rolex proclaimed it as the world's smallest chronograph. It was available in stainless steel or in 18K yellow or pink gold. In the same advertisement a Rolex 18K gold chronograph pocket watch was listed. The movement is the caliber 69 and is rhodium plated. It as 17 jewels, a strait line lever escapement, a mono-metallic balance, a shock absorber, a Beguet balance spring, and an index regulator. Auction estimates have this Rolex 3055 valued at $15,000 to $20,000. Rolex, “Oyster Chronograph, Anti-Magnetique”, with Oyster crown, Ref. 4537. Made circa 1950. The Rolex reference 4537 was only produced in 1946 and in a very small number of examples in stainless steel, yellow and pink gold. It is considered one of the rarest production references by Rolex for its Oyster chronographs. The reference 4537 was the predecessor of the Reference 6034. Matte silver with applied pink gold Arabic and diamond-shaped indexes, outer minute/seconds divisions with Arabic five minute/seconds markers, subsidiary dials for the seconds, the 12-hour and 30-minute registers, outer tachometer and telemeter scales. Pink gold dauphine hands. Caliber 72 Movement - 13''', rhodium-plated, 17 jewels, straight line lever escapement, monometallic balance, shock-absorber, self-compensating Breguet balance-spring. Dial, case, and movement signed. Diameter 36 mm and a Thickness of 13 mm. Auction estimates have this Rolex 4537 valued at $80,000 to $120,000. Rolex Reference 6236, "Jean-Claude Killy"
Rolex "Oyster Chronograph, Antimagnetic”, Ref. 6236. Made in 1958. The Rolex reference 6236 Anti-magnetic chronograph with triple date was produced in few examples from 1958 to the early 1960s in yellow, pink gold and very few in stainless steel, with various dial designs and hand shapes. Mr. Killy was an internationally renowned world ski champion in the 1960s and remains as the classy ambassador of Rolex in numerous advertising campaigns. The main difference between the 6236 and the 6036 is that the 6236 has a three body case and the 6036 has a two body case. It is extremely rare for a ref. 6236, with an exceptionally rare dial with sunk-in indexes, to appear on the open market in such clean and original condition. Auction estimates have this Rolex 6236 valued at $80,000 to $120,000. Rolex Reference 8171, Exotic Dial - "Padellone"
Rolex, "Perpetual, Officially Certified Chronometer," Reference 8171. Made circa 1950. Mr. Mondani to start a Rolex collection of highest quality. Mr. Mondani named the ref. 8171 as the 'Foundation' watch. Auction estimates have this Rolex 8171 valued at $70,000 to $100,000. Ref. 8171, Stainless Steel "Padellone"
Rolex, “Perpetual, Officially Certified Chronometer”, Ref. 8171. Made in 1950. Rolex, "Oyster Perpetual, Officially Certified Chronometer," Ref. 6062. Made in the early 1950s. Rolex, “Oyster Chronograph, Anti-Magnetic", Ref. 6034/6234. Made in 1950. Rolex, "Oyster Chronograph, Anti-Magnetic," Ref. 6234. Made in the 1950s. Rolex, “Chronograph,” Ref. 6238. Made in 1964. Rolex, "Oyster Cosmograph", Ref. 6238. Made circa 1965. Rolex, "Oyster Cosmograph Daytona", Ref. 6238. Made circa 1965. Rolex, “Cosmograph Daytona”, Ref. 6239, retailed by Cartier. Made in the early 1960s. Rolex, Cosmograph Daytona, Ref. 6241. Made in the late 1960s. Rolex, “Oyster Cosmograph, Daytona", Ref. 6262/6239. Made in 1969. Rolex, Oyster Cosmograph, Ref. 6240. Made circa 1964. Rolex, Oyster Cosmograph, Ref. 6263/6262 with black anti-reflective bezel. Produced in the 1970s. Rolex Oyster Cosmograph Daytona, Ref. 6263/6265. Made in 1974 for the "Fuerza Aerea del Peru". Rolex, "Oyster Cosmograph Daytona", Ref. 6263/6262. Made in the late 1970s. Rolex, "Oyster Cosmograph Daytona," Ref. 6263. Made in 1980, sold on October 1, 1981. Ref. 6263, Retailed by Tiffany & Co.
Rolex, Oyster, Cosmograph, Superlative Chronometer, Officially Certified, Ref. 6265. Made circa 1978. Rolex, “Oyster Perpetual, Superlative Chronometer, Officially Certified, Cosmograph, Daytona,” Ref. 16523. Made in circa 1990. Why is this Rolex called the "Floating" Cosmograph? The word Cosmograph is clearly detached from the rest of the writing. This dial version became known to collectors as the "floating " Cosmograph. 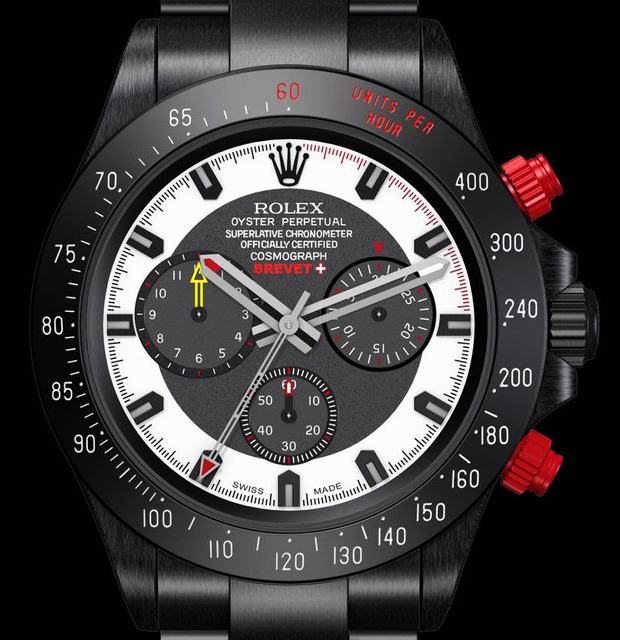 The Rolex Daytona FORMULA 1 Limited Edition was produced by Rolex a limited quantity of 13. Notice: SANT BLANC is not an official nor an authorized Rolex dealer for any product offered or sold and SANT BLANC has no affiliation with the manufacturer. All brand names and trademarks are the property of their respective owners and are used for identification purposes and or educational purposes only. The timepieces on this page are not offered for sale. Rolex is a registered trademark of Rolex Watch USA Inc. SANT BLANC is not affiliated in any way with Rolex.